AVAQMD staff recommends the adoption of the resolution under Health & Safety Code (H&S Code) §40709.6 to approve the transfer of certain offsets credited and registered within the Mojave Desert Air Quality Management District (MDAQMD) and the San Joaquin Valley Unified Air Pollution Control District (SJVUAPCD) to the AVAQMD for applicant Palmdale Energy, LLC for potential use as offsetting emissions. The Palmdale Power Plant is hailed by the United States Environmental Protection Agency as “the cleanest power plant ever permitted,” according to a Palmdale City news release. It will provide the County of Los Angeles with $6 million dollars in tax revenue annually, 4 to 6 miles of paved roads, a $20 million dollar trunk line to connect the Palmdale and Lancaster recycled water systems, 35 permanent high paying jobs at the power plant, dozens of indirect jobs as a result of the power plant’s operations, $5 million infused into the local economy annually, and enable older and dirtier power plants to be taken offline, according to city officials. For more information on the Palmdale Power Plant, please visit www.cityofpalmdale.org. 25 comments for "AVAQMD staff recommends approval of offset credit transfers for Palmdale Power Plant"
Here’s the deal with the emissions from the Palmdale Power Plant. We don’t think of air having’ any weigtht. Y’know, it just floats all around us. So, a report says X tons of CO2, it sounds horrible. Tons of anything sound horrible. Well, the average human exhales almost half a ton a year of CO2. Yes, you do. In a valley of half a million, that’s a lot of CO2 coming from those other people, not you. See, this is all complicated stuff with credits and things and Parris and Crist are just simple folk who don’t know about a different type of ’emission’ that I can’t write here. In today’s AV Press, an article on the meeting Tuesday mentioned that Moody’s Investors Services said that it could hurt Palmdale’s credit rating if the plant was denied. You don’t suppose Rex has that as an ulterior motive, do ya? Nothing he does surprises me and I always suspect the worst from him. He has earned it. It certainly isn’t about the emissions because the CEC said there is NO COMPETENT EVIDENCE that there is any rish from the plant. Does Parris or Crist have any competent evidence that there is a risk or is it just their ‘opinions’ pulled out of their behinds? I grew up in Burbank, can’t ever remember being with out the power plant, I believe Glendale has one also. No problems, work great. King rex could give up trying to stick it to Palmdale and take care of Lancaster, it needs it. Do the dust storms come from the solar plants to the west? I think Palmdale rates higher in solar than lancaster in solar also. Take care of home rex. 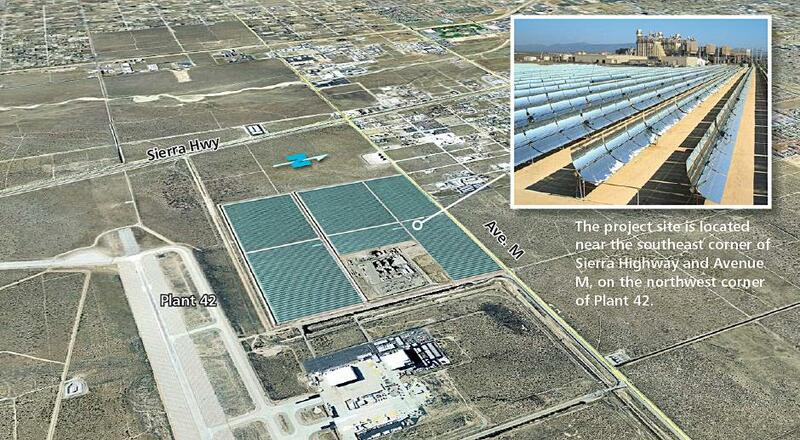 Solar plants to the West of Lancaster are like a postage stamp on a tennis court. Also dust storms in the desert are older then historical records. That story that rated Palmdale higher than lancaster, only counted solar installations in 2011 and 2012, not total systems in operation. Lancaster is home to one of the oldest solar installation companies in the nation. I would say the dust storms have been worse since the solar fields have been installed on the west side. I have never seen dust clouds blowing through north Lancaster like they have for the last couple of years only way to the north around avenue D.
Palmdale citizens “MISLED” not getting lower electric rates! …….supporters and outside company get rich $$$ on the backs of citizens! Dont let this headline happen show up to the meeting!!! I live in Palmdale and I was hoping that a power plant would lower my electric bills and was on the lookout for such a statment. I never heard anyone say that residential users would get lower rates. What is your source for that statment? Palmdale not only was going to bring its citizens cheaper rates but use it to bring in business and Plant 42 Aerospace contractors by offer them cheaper rates.Fact! William can I ask all of you a very simple questions. Just as many construction jobs would be created if it did not have the gas power plant and was all solar. Why sell it ? Burbank owns there’s what Palmdale not capable? HIRE Burbank dont sell it right? Wake up people, your being suckered!!! !open your eyes your being misled. If my math serves me correctly, that would be five words, not two. It’s not as bad, though, as your convoluted logic. Who the hell cares who owns an electric plant? I just want my lights, my computer, my phone, my refrigerator, and my other appliances on when I need them. This electric plant will produce electricity a hell of a lot cheaper than solar and with out exposing us to valley fever. If you dont care about citizens being misled and being taken advantage of, then I dont know what to tell you man. You dont care that this group but a $450 annual tax bill for the sewer plant to supply treated water for the power plant on everyone’s tax bill for the next 30 years. Maybe you just dont know. Its ok most people dont because there tax bill and mortgage are all on one bill. This plant has a huge field of Solar in it. why is it that huge fields of solar, only cause valley fever if they are North of Ave M? Private Interest? That’s funny coming from the Regional Director for REC Solar, who has current contracts with the City of Lancaster… You’re just another one of Rex’s bought out cronies, whose comments on this are CLEARLY self serving. Who said that the power plant would lower rates for residential consumers and when was that said? I was hoping for it but I never heard or read it. AV Press just said it in this Fridays paper. I have a paper from 2006 too. I had heard it somewhere, it wasn’t here, but I found this link. Initially proposed in 2001 following California’s self-induced energy crisis, the Palmdale power plant was sold to local businesses and residents as a chance to provide cheaper, cleaner and more reliable power to the community. @ Cary. I realize you took that paragraph from the link you provided but it isn’t an direct quote from Mayor Ledford or anyone else, just hearsay in a news article. From my own recollection back then, it seemed that the benefit was directed towards business and industry as far as rates and a reliable supply of electricity. I don’t recall that lower residential rates were promised by Mayor Ledford or there would have been more widespread interest and enthusiastic support and a big demand for a power plant all these years. There really hasn’t been much public support for it in Palmdale, more like mild acceptance or indifference. Do you have any direct quotes or written documentation by Mayor Ledford or anyone else from that time that promised residential users lower rates? Todays mail brought an announcement for a meeting at the college to stop the power plant. Return address is Lancaster City Hall. On the front the message is from Bret Banks, operations manager, avaqmd. Did rex buy another one. Anybody else get their pack o’ lies postcard from the City of Lancaster today? I wonder how much money they spent for this pile of poop to be sent to everybody… And how it might have been better spent by the City of Lancaster for its citizens than on yet another egomaniacal Parris crusade against anybody he can’t buy. I love the last line “according to city officials”. We all know how honest the goons at the city of Palmdale are. It seems like we are getting a load of garbage. No matter how you look at this it is terrible for the AV. Yeah. And you are an expert on power plants and astrology. Yes. ‘Palmdale,’ we all DO know how honest the city officials at the City of Palmdale are… Very. Hell, they’re practically saints when compared with Parris and his lying cronies at the City of Lancaster. anyone see Time Warner news tonight? a tour of a power plant in Burbank and the residents there are good with it in the middle of town? cars on the streets spit more fumes than the power plant? ut oh.